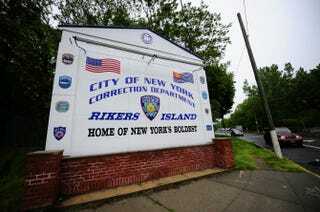 Rikers Island inmates had easy access to cocaine and oxycodone, aided by about seven correction officers who used their authority to sneak the narcotics into the New York City jail complex, the New York Daily News reports. The implicated guards were paid $400 to $900 to smuggle the drugs in over the last six months, the Daily News notes, as discovered by a continuing investigation into the jail by New York City’s Department of Investigation. “By smuggling drugs into Rikers Island, these corrections officers jeopardized the safety of the city’s jails and sold their honor as officers of the law,” Department of Investigation Commissioner Mark Peters said, according to the news site. An undercover Drug Enforcement Administration agent recorded the smugglers talking business in the case, which also resulted in charges against an inmate and his girlfriend, the Daily News reported. Correction Officers Steven Dominguez and Divine Rahming reportedly bragged about their illicit dealings, offering to use their authority to spread the deals beyond the problem-ridden jail, according to the news site. Another officer, Deleon Gifth, is accused of arranging for a friend to get oxycodone into the prison back in February. Gifth was indicted on Monday; Domingeuz and Rahming were indicted on Tuesday. Other alleged crimes committed by other correction officers include not reporting the illicit activities even after knowing of the situation and moving around inmates at their request to meet with other prisoners or to make phone calls.